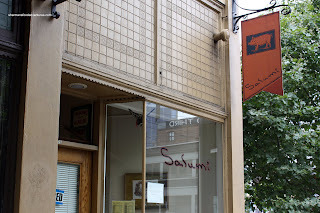 Last year, I visited Salumi for the first time. For those who unfamiliar with Salumi, it's run by Mario Batali's father, Armandino Batali. Famous for their cured meats, sandwiches and gnocchi made every Friday by his older sister Izzy. I tried 2 of their sandwiches. Both were not very impressive, especially since they were almost $10.00 each. Why? Well, when I was in line, I noticed 2 Rubbermaid storage containers full with pre-made sandwiches in the cooler (refer to the picture). When I ordered my 2 sandwiches, I witnessed them being retrieved from those same storage containers. They were sliced in half and wrapped up for me to go. When I opened the packages up, it revealed very little filling squished between ciabatta buns. The chewy and cold sandwiches tasted alright; but Viv and I really didn't feel they were worth $10.00 each. Furthermore, why would I need to go to a place like Salumi if I wanted pre-packaged sandwiches? Now with my post came passionate, sometimes rude attacks which ranged from dismay to downright unsubstantiated remarks. Now, I have no problem if someone points out that I was wrong about something. For example, I incorrectly identified the schnitzel at Old Bavaria Haus as veal when it was pork. Fine, my bad, I stand corrected. That is a factual error. Now, when people say that I was wrong or I am on drugs to say I personally didn't like Salumi... then some people have truly mistakened opinion over facts. There is no right or wrong when it comes to personal preference. Plain and simple. Just like someone can like a restaurant that I do not like. It's a free world, people can like whatever they want. So I was a bit taken aback when people would just not quit in saying that I was wrong. In fact, one person even implied I was lying since he has never seen pre-made sandwiches for all the times he's went to Salumi. Uh... I have a picture to prove it. Therefore, I really don't understand where some people get their facts. I always report what I personally experience. Some suggested I tried the wrong sandwich, especially since I did not try their signature Porcetta sandwich. Okay, that's fair enough. I was more than game to try it once I made it down to Seattle again. Of course that was not good enough for some, and they continued to exert little jabs whenever they could in the comments section. Okay, enough of my ranting. 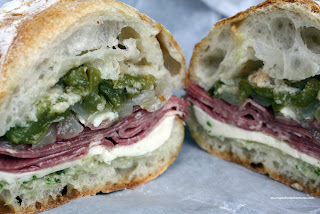 So, to fairly assess Salumi, I lined up for a second time in the cold to get at some sandwiches. One thing I immediately noticed was the absence of the Rubbermaid tubs. Second, when I ordered a Porcetta and a Tongue Sandwich, the cold tongue sandwich was made freshly in front of me. 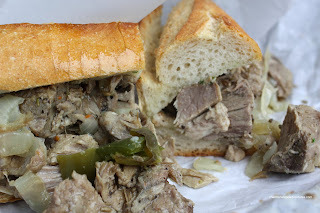 When I finally got at Porcetta, I gotta admit, it is one darn fine sandwich. 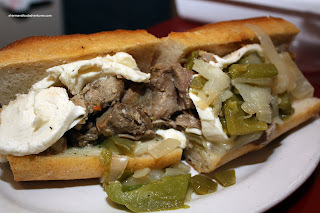 Tender, fatty pork laced with fennel topped with onions, green peppers and fresh mozzarella on herbed olive oil brushed bread danced around in my mouth. Now that is worth the money! The only thing I'd change about this sandwich is the bread. I realize it has to be firm to hold up to the moisture from the pork; but it is a bit too chewy. Every bite only helped destroy the sandwich further. Now, for the tongue sandwich. As you know, I love tongue! The sandwich consisted of ciabatta brushed with herbed olive oil with the same peppers and onions along with thinly sliced tongue. Everything tasted alright; however, I though the tongue was way too salty and took away from everything else. Also, once again, the ciabatta was too hard for my liking. Don't get me wrong, just like the last time, I didn't hate the tongue sandwich. In fact, it was pretty good. But it was not that good and certainly a bit expensive. So my final thoughts about Salumi this time around? Yes, the Porcetta is one fine sandwich. I totally agree with everyone who has said so. Worth every penny. As for the other 3 sandwiches, they were good; but not outstanding. I would say that the tongue sandwich was better than the Muffo and Prosciutto, Figs & Goat's Cheese that I had last time. If I were to base my thoughts on this visit alone, I would not hesitate to press "I like it" on Urbanspoon. However, based on both visits, I would still categorized my feelings as "indifferent". You don't even have these mention these rude attacks, Sherman. They are just not worth the mention. I know you (as with any blogger) that disagreement of opinions, factual errors and what nots are something you can easily own up to. But RUDE attacks (or all sort of attacks), tells a lot about the smallness of the little people who can't do anything more effective than to post cowardly remarks. LOL ... I am curious. If you did not particularly rave like Salumi so much, why go back? There are lots of places you could try in Seattle. Anyway, from the pictures it looks like something that I would like. Thanks for the support Ben! It's much appreciated from someone who understands. Yah, I have no problem with a difference of opinion. But by being aggressive and imply that I'm lying is out-of-line. Also, I have pictures to prove my points. I'm amazed how other people make unsubstantiated claims and in turn call me out. That just doesn't make sense. Why did I go back? Well, I heard that the Porcetta was really good, so I decided to see myself. I'm open to changing my opinion too. However, in this case, that was a one hit wonder. The other sandwiches didn't impress me much. Yah, I encourage you to try it. I'm sure you'll like the Porcetta! oh, geez... i think some people are so passionate about their favourite eateries that they will defend them to the end, despite any evidence that points to questionable practices. having backed up your statement with photo evidence, you did your part. the evidence is there and we can all see it - if the die hard fans choose to pretend it doesn't exist, then that's their deal. it's so wrong for them to attack you in the way they did though. i think it's quite honorable of you to go back and give that place a second chance!! that being said, i'm glad you had a better second experience but after your reviews, i would pass on this when in the area. seems like it's overhyped and it underwhelms. some places just create a big following - like cupcakes, when they first opened. i like that your reviews are honest and authentic - something that is difficult to find out here in the internet world. Thanks for the kind words Trisha! Yah, I try not to let those people get to me, but at the same time, I want to make people understand that I do this with my own money and time. Thus I have no other motivation than merely blogging about my experiences. I just hope people can understand that differences of opinion exist; and no amount of rudeness can change people's minds. Only way that can happen is a revisit which I've done. I am glad you heed my words and gave the porcetta a chance. But, agreed that the rest of the sandwiches were subpar. Trisha, I heard that Cupcakes now even have TV series. Talk about hype! You can get good Porcetta from the Italian place at Commercial Drive. I bought a whole 2-pounder from Costco that I cut/sliced for cooking/sandwiches. You're either a saint or an extremely good-natured man to give them a second chance. It makes me wonder why are you're spending so much for a thankless job when others are getting the publicity. Perhaps a little investment in a new template ... to generate ads income. I dunno EnbM... I know I could be making more money with more ads. But for some reason, I just don't want to create a site that is unnavigable due to ads popping up everywhere. It started as a hobby and it has become something more. For those who are obviously negative, I can only try to be civil. However, my new approach is just to delete those comments. I think I have built enough integrity whereas I do not have to defend myself. As for the regular readers who make constructive feedback and comments, I really do appreciate it. Good for you for giving it another try. Not to appease anybody but to show you truly are neutral and willing to give them another chance. I'm not sure AI would do the same. A ten dollar sandwich served to me form a Rubbermaid container would make me really angry. 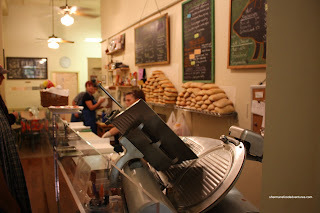 How did you think the sandwiches stacked up against say, Finch's or La Grotta del Formaggio's? I personally like the stuff from Finch's more. I think for the same price, the sandwiches at Finch's taste better and have more filling (except for the Porcetta). In terms of value, La Grotta takes the cake since they are so large and have tonnes of filling. I'm not sure if I would say La Grotta tastes better than Salumi, but definitely a better deal. Actually, and you have to believe on this one, I won't. There are so many other things I can eat, there is no point to lineup for it. So it's not about proving a point or not, it's just not that much of a "must eat" for me. Armandino Batali founded it, but he doesn't run it any longer- it's run by the aforementioned daughter and her mate. I've eaten pretty well there couple times I've been there and look forward to getting back. But it's not a suitable object of worship.